Many classrooms throughout the district are incorporating mindfulness practices for students. Consider starting with yourself! 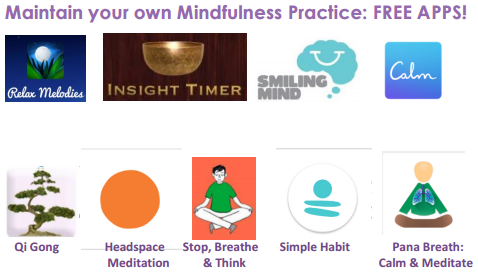 Maintaining your OWN mindfulness practice will increase your readiness for leading students in mindfulness exercises. 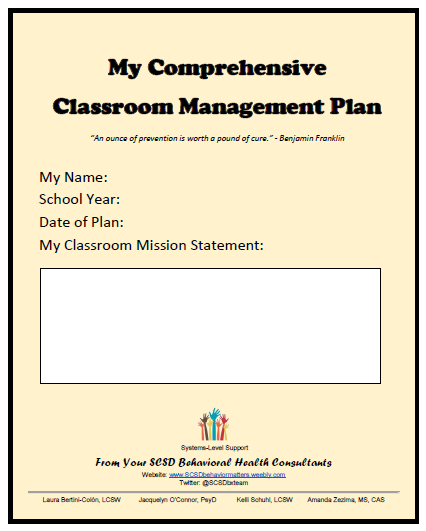 If teachers elect to customize this tool, which addresses all key components of classroom management according to various best practices and resources, their finished product will serve as their very own comprehensive classroom management plan. This document is used as a consultation tool with teachers, and also serves as a great resource for teachers interested in addressing to increase student engagement and positive classroom climate. ​Consider use of the classwide tools (scroll down to view) to assess your progress with praise:corrective statement ratios, student engagement, etc. Classroom Management Fundamentals: Discover resources for new teachers about developing routines, fostering classroom community, managing disruptions, and building student relationships. The following tools are often used by the behavior team as discussion tools for classroom consultation and monitoring changes in classroom engagement. We invite you to use these tools in the same way - please reserve them for collaborative, non-punitive efforts to help organize self-reflection and highlight areas of strength and need. Discusses the integrated relationship between academics and behavior, reviews a case study example, and shares behavioral strategies intended to support teachers working with students with primary academic deficits and challenging behaviors. Credit to Dr. Williams & Maria Richards for these resources, shared in their article, "Creating Safe Spaces: Social Justice Resources for School Psychologists" in NY School Psychologist Volume XXXIV, Number 3.